I mentioned King Mob Echo in my previous post on Rita Renoir. It’s the magazine of the English Situationist offshoot wich ran for five issues in the period 1968-70. Its historiography seems to be incomplete. 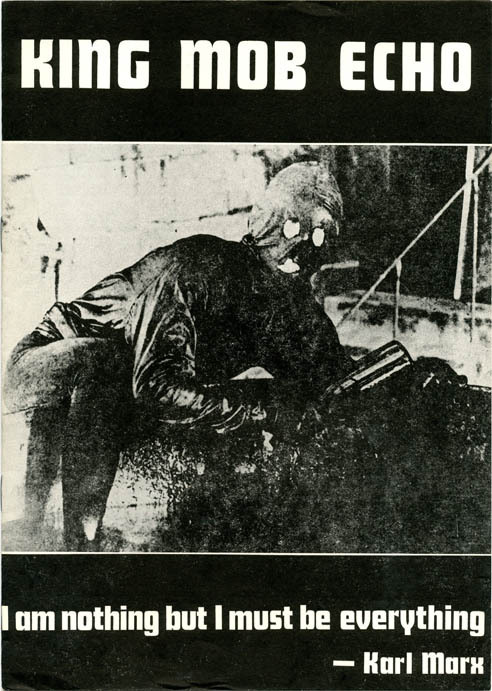 The first issue depicts and image of the Fantomas serial which Wikipedia lists as of the Barrabas film. Unidentified Fantomas film still, the caption above reads “77. Feuillade, Fantomas, 1912”. However, if you look closely at the image, you will see that the caption reads “77. Feuillade, Fantomas, 1912”. The Barrabas film dates from 1920 so it seems unlikely that the still stems from that film. The film, which lasts more than five hours, is here, I just don’t have time to watch it. Can anyone tell us from where this still is taken? It is also on the cover of Fantomas: The Corpse Who Kills (2008). Most sources researching King Mob attribute this dictum to The Eighteenth Brumaire of Louis Napoleon, but it’s not, it’s actually from Critique of Hegel’s Philosophy of Right and reads in the original German: “Ich bin nichts und ich müßte alles sein” and is recently translated as “I am nothing and I should be everything”. 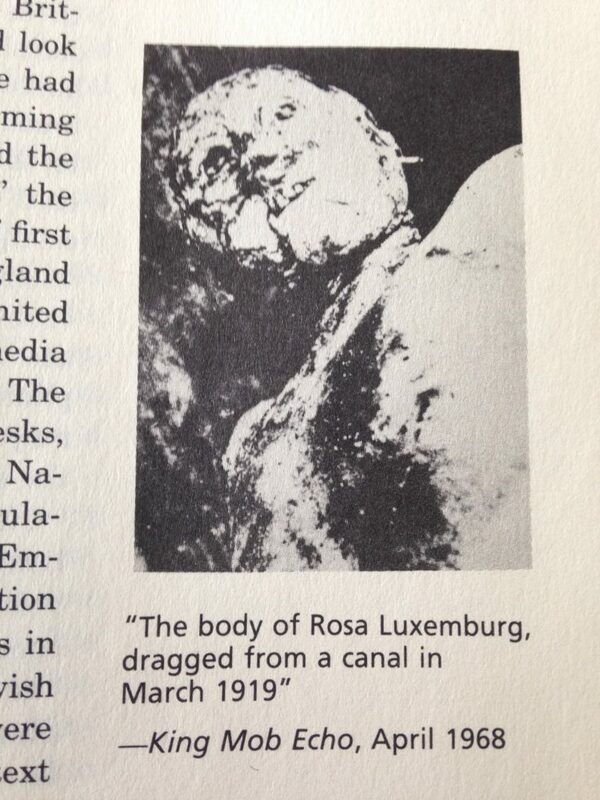 Thirdly, there is the case of the photo of Rosa Luxemburg’s corpse. I’ve known this photo since I read Lipstick Traces, featured in their section on King Mob, but I would very much want to find out where this photo was first published. This entry was posted in Uncategorized and tagged King Mob, Situationism, surrealism on January 13, 2019 by jahsonic.